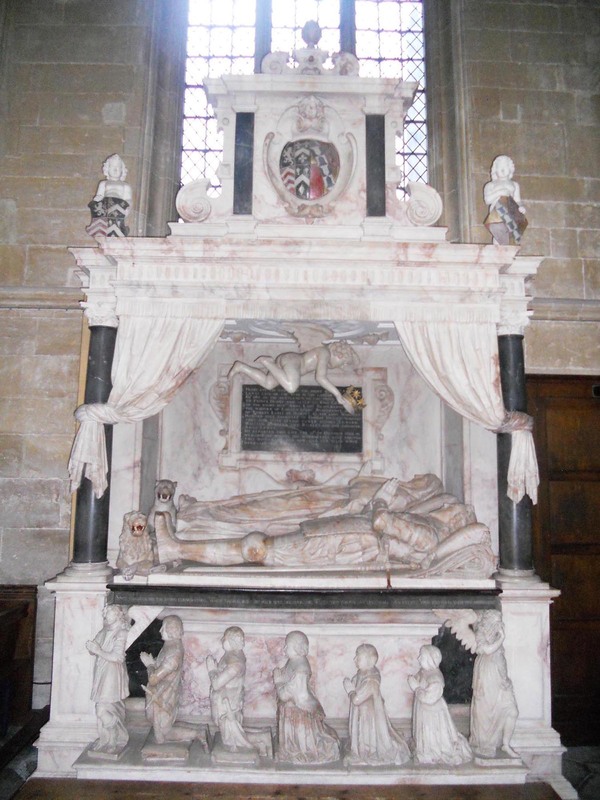 Among the many fine monuments at Edington is the magnificent standing wall monument of Sir Edward Lewys (†1630) and his wife, Lady Beauchamp. 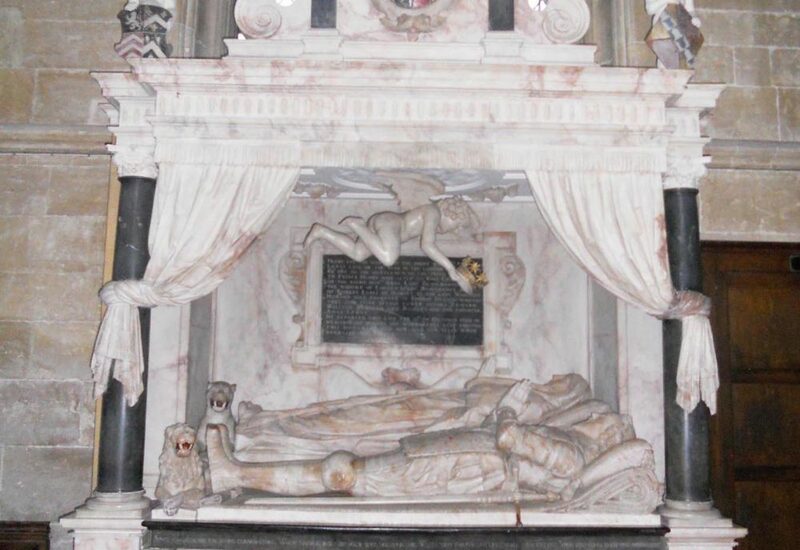 Undoubtedly metropolitan work, it shows a cherub offering Sir Edward, whose wife lies beside him, a heavenly crown, while below their children kneel along the side of the tomb-chest, flanked by angels. Additional cherubs hold shields of arms atop the structure (Fig 1). 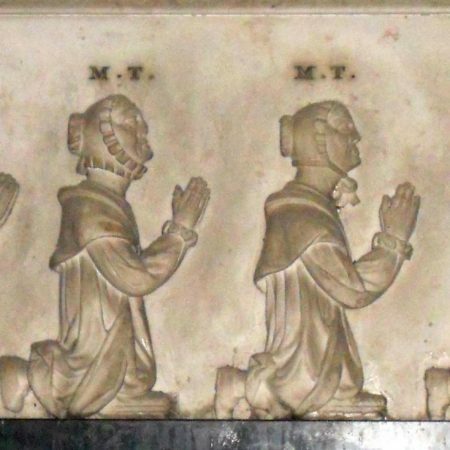 Each of the kneeling figures is identified by their initials (possibly an allusion to another monument in the church, that supposedly to John Bayntun, which has initials as well as a rebus). The figures are apparently rather crude attempts at portraiture, almost caricatures, showing the men wearing gaiters with knee-britches, coats and stocks, and the women with loose pelisses, tippets, caps and sensible shoes. Their clothes are old-fashioned, belonging to the 1810s rather than the period at which all but the mother died (she is dressed the same as her daughters, but her features are less aged). 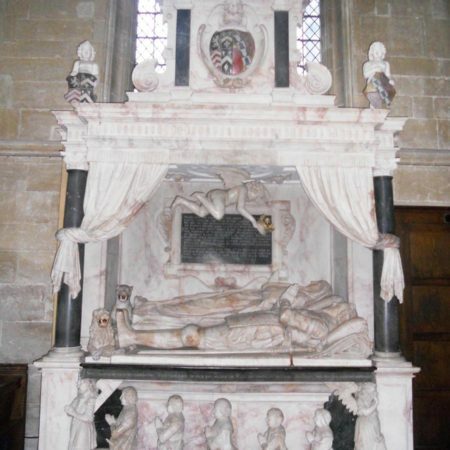 The impression given of a funny old farming family might be ascribed to the ineptitude of the carver (Fig 3) were it not that the remainder of the monument, including the three angels, is quite competent (the angel copied from the Lewis monument is the least accomplished). This raises the question of whether the intention of the patron was to construct what might be termed a dialect monument. There was a fashion for dialect poetry in the nineteenth century: William Barnes is the best-known exponent, but Tennyson also wrote some notable poems in the Lincolnshire dialect. 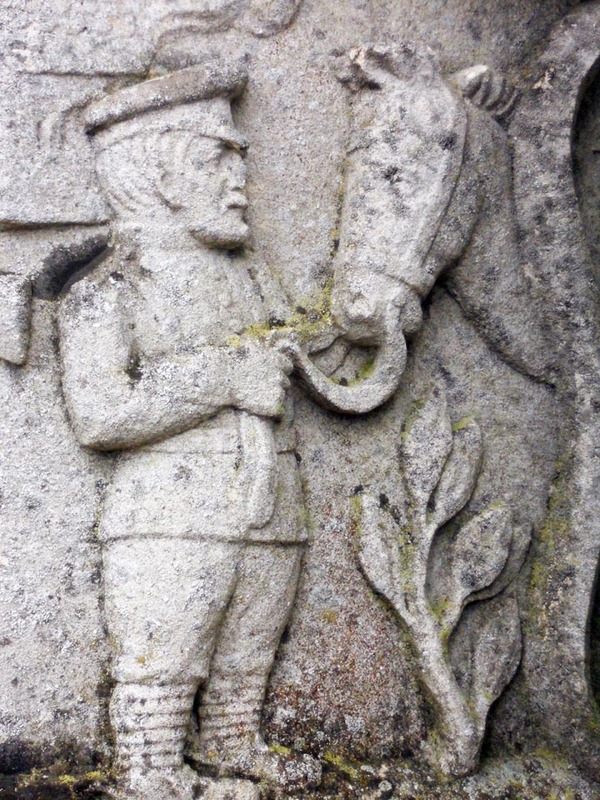 The best example of the use of what may be termed a dialect-style is the Waggoners’ Memorial at Sledmere, North Yorkshire (Fig 4), where the exploits of the Waggoners Reserve during the First World War are depicted in a rather cartoonish style, together with dialect verses in their praise: clearly the visual effect of the carvings is designed to echo the dialect verse. 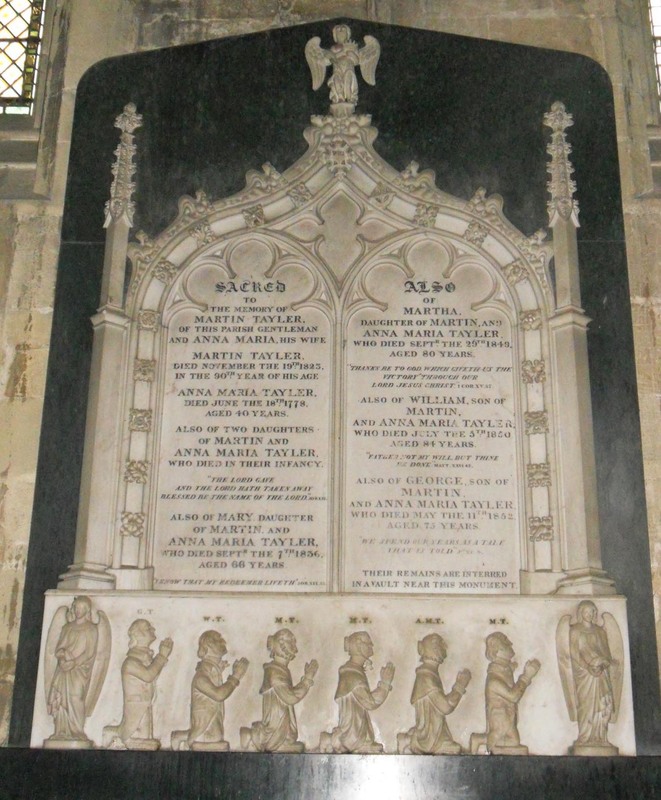 It seems likely that a similar effect is being sought in the Tayler monument. It satirises the aristocratic monument to Edward Lewys by repeating elements from it, but in a style that emphasises the rootedness of those commemorated in the area. 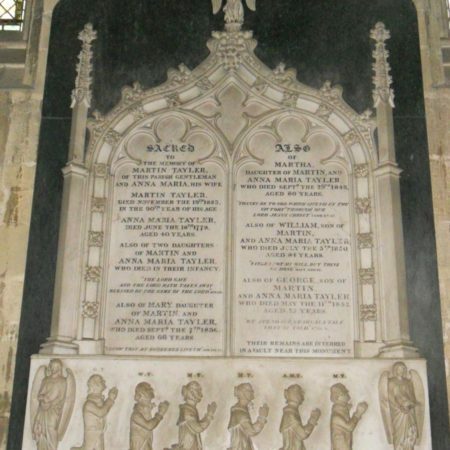 Martin Tayler, the father, is described in the inscription as a ‘gentleman’, as is Lewys; he gets a heavenly crown, as does Lewys. 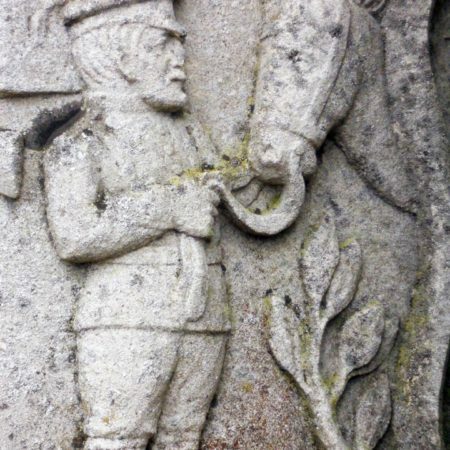 The old-fashioned garments emphasise the antiquity and continuity of the family, and this feature may again link the monument to dialect poems which often oppose stable country values to modern urban ones. The monument both mocks the non-resident aristocracy and asserts the validity of the stable farmers. George Tayler was evidently a man who liked people to enjoy themselves. He left monies in trust to four local villages – Edington, Steeple Ashton, Keevil and Poulshot – much of which was dedicated to providing children with cake. 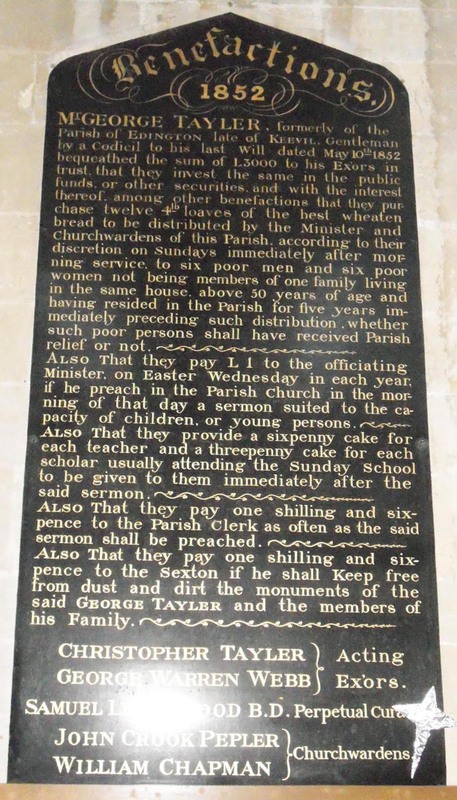 The Edington benefaction board (Fig 5) shows the terms of the bequest: these differ from the other three villages only in the provision for the maintenance of the family memorial. The board at Keevil also survives. 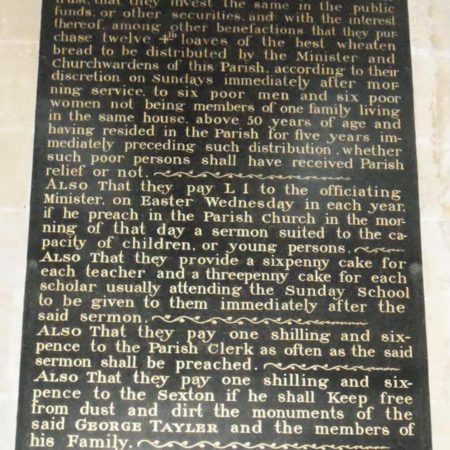 Similar farinaceous provision was made for the Methodist church in Edington (a sermon suitable for children followed by cake). At the end of the nineteenth century yeast-raised currant buns were a penny each, so a threepenny cake would have been pretty substantial. The character revealed in the charitable bequests ties in well with the parodic nature of the monument.